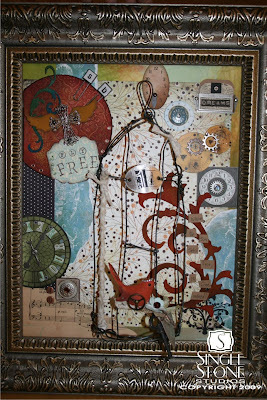 "Fly Free" is a lovely mixed media piece created by Shelley of Single Stone Studios. I know any you who have been reading my blog have seen me mention Shelley lots and lots of times. 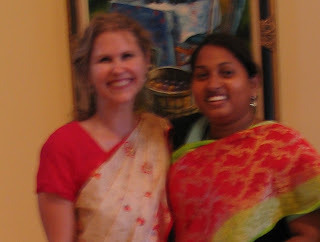 She has been a wonderful encouragement and "sounding board" for my work. So I was really excited when she requested a wire birdcage and some of my new wire words. Even more excited when I saw what she was doing with the pieces. 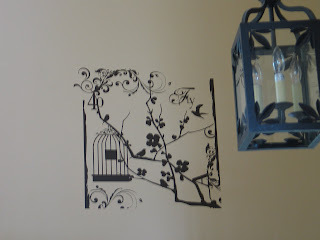 She began by altering the birdcage by rounding it out and then embellishing it. I just LOVE the results. She used bits and pieces of things and it really made the wire form more interesting to see and it starts to tell a story (you can see more about this piece on Shelley's blog). So it got me thinking and I started to see some of my wire sculptures as armatures or a framework to be embellished. Last winter one of my first sculpture pieces was this heart with wings. I actually created my scribble heart for this piece. It's still one of my all-time favorites and has the added glow for me of having been featured in the Sew Somerset of Winter '09. Yay! My first published work. So early on I started to play with this sort of embellishing but somehow dropped it in favor of other project ideas. Watching Shelley change my work and run with it made me want to pick up that direction again and see where it could go. 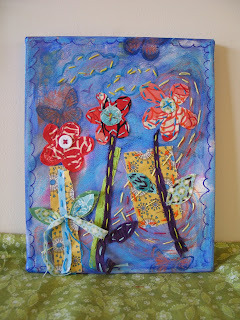 Buttons, twine, lace, found objects, beads, old keys... the ideas for embellishing just go on and on. So yesterday having a bit of time on my hands I played around with one of my little scribble hearts again and approached it with that blank canvas attitude. I wired on buttons, tied on fabric scraps, and added some string as well. I had a little red man game piece wired in too but Jasper informed me that this was his ketchup man and I couldn't have him. So he got cut out (escape!). Then because I loved it so much in my first sculpture I added a color pencil to pierce it. It's rigid horizontal line just seems to be the perfect contrast piece to the rest of the sculpture's scribbly organic lines. Playing around with this heart was a fun way to revisit the first piece and yet try some new things. But I'd like to keep going with it. I'd also like to know what you would do with one of these. If anyone reading this could pipe in with what they'd choose to include I'd love to hear it! Thanks as always for reading! I really enjoy any chance I have to be outside spending time with friends and my little boy in the spring. New to us this year is our Tues. & Thurs. soccer nights. Never a sports enthusiast I secretly thought I'd be skipping these and letting Jeremy take Jasper. 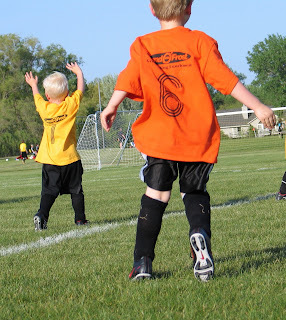 But as each opportunity comes around I can't resist the thought of sitting outside in the lovely weather and just doing nothing but watching my cute little orange shirted number 6 run around with his friends. The coach is a gem too. It can't be easy teaching 4 yr olds the sport, but he obviously loves it and is making a game of the experience for them. Jasper loves it! OK- Now I have to admit that the reason for that whole intro paragraph was just so I could use the soccer photo(Shameful!). I love the bright orange and yellow. The colors work perfectly with the work in progress I've been sharing with you. Here's the update on that piece: I defined the pot a bit more by adding some highlights and contours. I also grounded the piece by suggesting a surface area beneath the pot. Then I worked a bit more on the leaves, adding some viridian green and a bit of interference green-orange to define the high and low lights within the local color. Of course I couldn't resist mixing my media a teeny tiny teensy little bit and grabbed my sky blue neocolor aquapastel and scrubbed in a bit here and there. 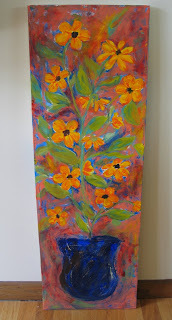 I really like how the light blue pops against the oranges and greens in the piece. I feel like it could use a little bit of purple yet but other than that and the urge to write in some text (which I'm fighting for once) I think it's done. I don't know if you do this, but as an artist I fall in love with bits of things all the time. It could be that new blue/brown combo, polka dots, birds, or a certain shade of blue. Sometimes it's a medium like the aqua pastels or the stitching and then for awhile I want to use that one thing in EVERYTHING I do. I have to fight the urge otherwise EVERYTHING I do ends up looking fairly similar. From decades of experience with this slightly fanatical and obsessive edge to my creative process I've come to the realization that other people get sick of seeing me repeat myself long before I do too. My mom still groans when she tells me of the year I drew nothing but elaborately ruffled princess gowns. Or the year I spent most days after school covering her blackboard with Cloud Cities(think Star Wars). I had swimming pools, escalators, and huge shopping complexes. In high school and early college I did waterfalls. Nothing but waterfalls. Flowers have always been the filler for me. The imagery I return to whenever I'm in flux. Last night my sweetie stayed up late to lend me his height and install my new Vinyl Wall Decal- "Fly" up above the front door. It looks fabulous!!! 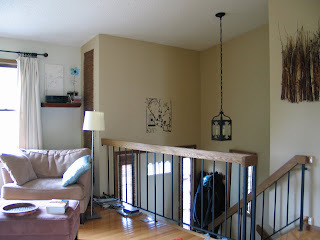 The spot has been a dead spot in my decor for years- I never really knew what to put there, it's a big area and is completely visible from the living, dining, and even kitchen of our split level house. Then suddenly it occurred to me how very very wonderful one of Singlestone Studios vinyl wall decals would look there. YAY!! I love Shelley's designs and wonderful thing- she offers to send me my favorite- "Fly"!!! I feel very very lucky!!! And compliments of compliments- my husband thinks it looks great too! He was particularly taken with the way it just rubbed on to the wall and is completely smooth on the wall surface. The look is perfect for our home. Artsy and modern yet the image has a scratched, "created" look I love. I had a chance to show it off to a friend today as well. I explained how much I like the fact that while there is a beautiful ornate birdcage, the birds have left it to sit amongst the natural beauty of the cherry blossoms and branches. I see the birdcage as representative of our very ornate and stylized culture. Although it is a beautiful place to live it can still keep us in a cage us. To fly free out into nature, to experience the world God created is sometimes an opportunity we take for granted. We forget the wonderful world that is outside of our day to day surroundings and stay in our cage, a part of the world but separated from it. I look at the two contrasting elements in this piece, the man made birdcage and the God created cherry branches and I am so glad in my soul that I am allowed to choose the trees. So this is a big "Thank You" to Shelley for creating such a beautiful and inspirational bit of art for me to now enjoy daily in my home! For more of Shelley's designs please check out her Etsy site here or her blog here. Or click on the link at the side of this page! A little update on my mad scientist projects. A couple of days ago I decided to turn some old nut containers and a pepperidge farms cookie tin into storage for some of my supplies. They weren't pretty though so I decided to alter them. I finally opted to go for the spray paint because I wanted cream and I also wanted to try using the paint on one of my little sculptures. 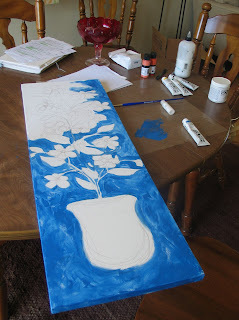 I sprayed the little container with a primer first and that really gave it a nice hide when I sprayed the second coat. The larger one I just went for it and sprayed and you can see in the photo that to get the same coverage I'd have to do a few more coats. But I kind of like the way you can see the image of the water that was on the tin showing through so I think I'll keep that one as is. The little flower needs a bit of sanding and roughing up but I think it'll look nice. Once I had that basic cream coat I decided to try out my new "pool" paint dabber from Tim Holtz's line with Ranger. Love the blue green color. I dabbed then twisted to get the polka dot effect. That still looked a little rough so I went around each dab with a brown watercolor pencil. 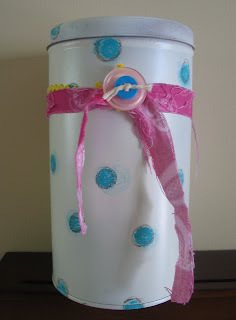 To finish I tied a couple of fabric strips around the middle of the tin and then topped that off with a little stacked button embellishment. I've been pretty taken with the whole flea market look that's been everywhere lately but have lacked some of the materials to play much with it. This weekend though I was treated to pretty much anything I wanted at a charity garage sale. Everything was amazingly cheap and because it was my birthday my dad (who was organizing it) let me fill up a couple of boxes and paid for them as his birthday gift to me. YAY! There were about 20 long tables full of donated items and some of it was complete junk, but much of it caught my artist's eye as full of possibilities. First, my dad directed me to a craft table and someone had apparently decided to drop the stamping hobby because there were boxes of slightly used stamps, completely unopened findings, some Tim Holtz decoupage materials, some 7 gypsies chipboard and cloth stickers, and a TON of ink pads and embossing powder. Some of the ink hadn't been opened yet and came with a bottle of ink refill taped to them as well. There was also some of those big clunky punches in a couple of pretty scalloped squares. It was so much fun to go through it all! I love getting art supplies for a present!!! Then I started to browse the rest of the sale. There were some really pretty old green metal trays in a pile by housewares and in the dishes section I found a beautiful chipped red glass compote. I can't wait to put lilacs in it and see them drape down. Lovely! Then I found some old books, some corkboards, and an old green filing cabinet for $2. I loved the green of the cabinet but knew that talking my husband into letting me bring it into the house would be a daunting task. Try as I might to avoid it though, I really felt drawn to it. So right before I needed to be done and take Jasper home I just walked over and opened it. I pulled the top drawer back and looked inside and in the very back behind a metal partition I saw some old card boxes and a large size cottage cheese container along with some old letters. Idly I opened the card box and found inside 2 antique pocket watches. Excited I ran over to show my dad. Then I started to pull out the rest. The cottage cheese container was full of old gold jewelry, and watch chains. One of the chains has a beautiful old locket attached to it and when I opened it there was the most beautiful old portraits, trimmed on the top and bottom with tiny little bits of red velvet ribbon. Almost as if they'd been draped. Precious! By now there was a small crowd around me and they were making their own discoveries. A small leather change purse held old gold coins as well as a collection of memorial coins. One was big and German. The cottage cheese collection also produced a pair of wedding bands inscribed, AK to LA and vice versa. Very plain bands, very small fingers. So lots of family memento's, but there were also drawings done by kids, a title to a car, an old account book dated 1845, and some graduation announcements from the 70's. It was soo exciting to find it all! I assumed right away that the owner had died and someone who didn't know had dropped off the old cabinet to get rid of it. I thought it would be an adventure tracking down the next of kin and surprising them with these family treasures. But my husband being the practical man he is looked first in the phone book. He found the owner's name, phone number, and local address immediately! He was living in a retirement home and although not home then, he was there when my dad stopped by the next day. Although he's REALLY old and didn't recognize much, he did know his father's (AK) pocket watches when he saw them! He couldn't believe that someone had found them and returned them to him. Good deed well done! I had planned on including photos of the items in this blog- but after we found out he was still alive it seemed like that might be an infringement. Still it is fun to tell about! I just think it's great that although sometimes the jobs God gives are hard, every once in a while he gives us a gift like this- a task that's just a complete joy! I guess the wrap up to this is treasure lost and found. Someone donated their old art materials and it is a treasure trove of materials for me. Someone else lost a significant part of their past and was able through a donation to have it discovered and returned to them. Through the generosity of a lot of individuals who donated their junk, my father's garage sale made almost $3000. before expenses, for Habitat for Humanity. And I, because of my discovery of this hidden collection, had an experience I will treasure always! Plus lots and lots of good stuff! 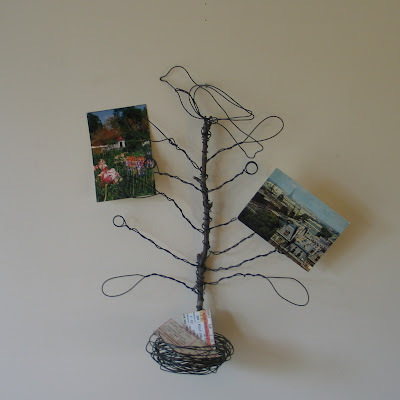 For some time now my Etsy shop, bird from a wire, has been helping to support an orphanage, Mercy Orphanage, in India. They now have a new website and I thought this would be the perfect opportunity to share with everyone who they are and what their mission is. First, my involvement came about through my father's connection to the orphanage. He met Connie Meyer- Schultz, a supporter who's amazing story you can read about on the site, through my grandmother who lived in the same tiny town in upper Minnesota. He immediately took the entire cause to heart as well and has done a lot of work on behalf of the orphanage's children. Last summer I had the chance to meet two of the people responsible for the children at the orphanage and my view of what I can do to help others changed. For a while I had been praying to God to use me. More specifically to use my talents to help others. I figured God had blessed me for a reason and I wanted to share my blessings with others. It wasn't long after I started my Etsy shop and prayed that prayer that an answer came. I met Raj and his wife Juwonya and had the chance to see the wonderful impact that these two dedicated christian people were able to have in the lives of others. They not only minister to the hearts of these children but are dedicated to giving them a nurturing, and protected place to live. They feed and care for them, they are seeing to their educations so that these children are able to carve a better place for themselves, and they are giving them hope by teaching them the gospel. Raj shared stories of finding street children and bringing them home, of church's that are being persecuted, of a culture where trafficking of homeless children can be expected. I heard how mothers, dying from AIDs would bring them their children, and how they took each one. As a mother that just breaks my heart and yet I rejoice that there were people like this, and a place like this, to bring them. They are also reaching out to widow, lepers, and the handicapped. I believe whole heartedly in the good that the staff of this orphanage is doing and I LOVE that the money I send them goes 100% to their mission. It is literally food for the mouths of these children and a roof over their heads. The orphanage has decided to create a second location to house it's growing population. Much of the money that my Etsy site has donated is going to this project. So thank you thank you thank you to each and every one of you who has purchased from me for allowing me to make this difference. In fact, the site is doing so well that last month I was able to give much more than the tithe amount as a donation. My heart can not thank you enough! If you would like more information about this mission, please check out their new site at http://www.bludomain72.com/~mer/. Please take the time to look at the slideshow and if you feel led to support or encourage this ministry somehow- THANK YOU!!! I found a little time to play the other night and came up with these two designs. One is a jewelry display and the other is a photo holder. The photo holder just makes me laugh when I look at it because it's an image that I've noticed a lot lately while out driving and that it came out during my play just shows how single minded I can be. So I have a bird atop a tree. Then because I felt like it I added the nest. Have to admit that nest isn't all that practical. It's small and wouldn't hold much but the little birdie seemed to want it. It said "please please make me a nest!" So I did. Besides, who says even functional art has to be completely practical? As long as it's lovely! I also did this little mixed media piece over the weekend. I painted the background and stamped on it before I left for North Dakota and then added the stitching and doodling while I was there. I like it and it's happy but I think it might want a few more 3d elements. I'll let it sit for a while and see. I hope all of you are enjoying your spring and thanks for letting me share some of my play pieces with you! I bought a magazine today just because as I was flipping through it I saw an article about Odilon Redon. Odilon Redon was a French painter/printmaker who is best known for his Symbolist paintings. 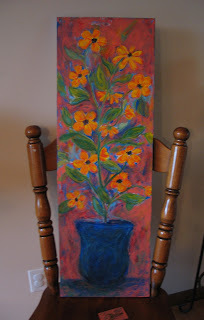 I love him best for his pastel paintings of floral bouquets. I stumbled upon an exhibit of his work at the Chicago Institute of Art years and years ago. I was there to see a Monet exhibit and in a little side gallery was this amazing composition with vibrant reds, indigo blues, and a gorgeous composition. A truly pivotal experience for me because not only did it introduce me to the lusciousness of pastels but it also gave me an image of beauty and composition that has been a standard of measurement I've used for my own works. This afternoon I was thinking about influences and how important they are. Much of my personality today for instance is a result of influences past and present. Experiences, people, places I've visited , and the things I've loved have all changed the way I see, act, and think about other things. More than just passing fancy, these are influences that have become part of the fabric of my being. It was almost 20 years ago that I happened upon this artist and he still has such an emotional hold upon me that I find myself purchasing a magazine JUST because it contains an article about him and shows some of his work. I've wondered occasionally about the importance of what I do, because really, what I do, is make pretty things. Not even things that people need. Just things that make me happy and reflect my aesthetic. But if a only somewhat famous artist from the 1900's can have such a big influence on me and my work- perhaps my life, my work, and my loves can have a positive influence in the life of someone else. And that gives me a lot of satisfaction. 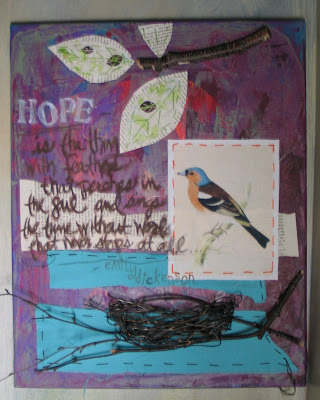 Maybe it's the bird connection, maybe it's just the magnificence of Emily's poetry... I don't know why this poem has become a jingle that lingers and pesters and sings to me at times but it has. Because I love this poem and because it has been right at the surface for so long now I've been wanting to explore it and own it by using it in my art. But like the thing with feathers it's been ever present but illusive and I've not found the right place for it. Last week it became the text of a mixed media piece I've been working on. The art work itself has been lingering for quite a while as well. I did the background months ago during one of those slop it on paint sessions and the stitching followed about a week later. 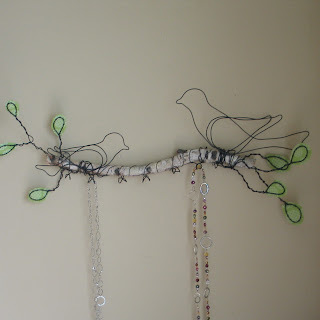 The wire nest was next and although I knew I wanted a bird for the piece I was stalled out for a while trying to imagine the right medium to use for that bird. I wanted the look of an old illustration but didn't want to draw or paint it myself. So a photocopy seemed the best answer but I didn't fancy the look of a piece of paper glued on. It seemed too one dimensional in comparison to all the 3d work that I had wired or glued on. But I didn't want another sculptural element either. It would upset the balance between 2d and 3d to add another 3d piece. SO I let the entire work alone for a couple of weeks and let my subconscious work on the solution without me. :) Finally I decided to print out the image on fabric and then stitch it on.